Product prices and availability are accurate as of 2019-04-10 18:47:05 EDT and are subject to change. Any price and availability information displayed on http://www.amazon.com/ at the time of purchase will apply to the purchase of this product. 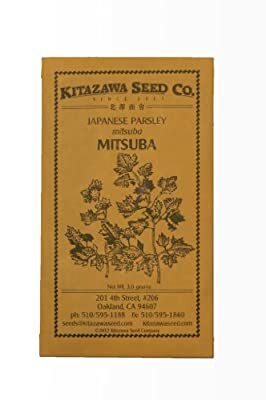 Also known as Japanese hornword or Japanese wild parsley, this native herb is a popular traditional vegetable of Japan. It's long, attractive stalks have trefoil leaves that are aromatic. Although perennial by nature, this plant is grown as an annual food crop and is excellent when grown as microgreens. Start your own herb garden. Planting and growing information is provided on the seed packets. Seed is untreated. Kitazawa Seed Company does not sell GMO seeds and has signed the Safe Seed Pledge developed by The Council for Responsible Genetics. FREE SHIPPING for valid US postal addresses.